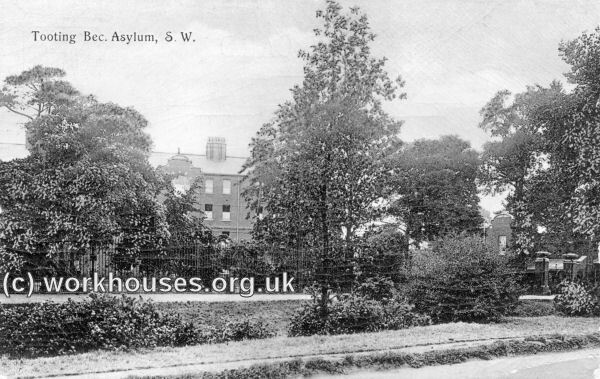 Tooting Bec Asylum was the fourth asylum hospital to be erected by the Metropolitan Asylums Board to supplement the existing institutions at Leavesden, Caterham, and Darenth. It was intended to accommodate uncertifiable senile patients, infirm epileptics and other 'persons requiring exceptional individual attention'. As well as relieving the pressure on the other asylums, it was felt that moving sick and elderly patients to a less remote site at Tooting Bec would also make it easier for them to be visited by family and friends. 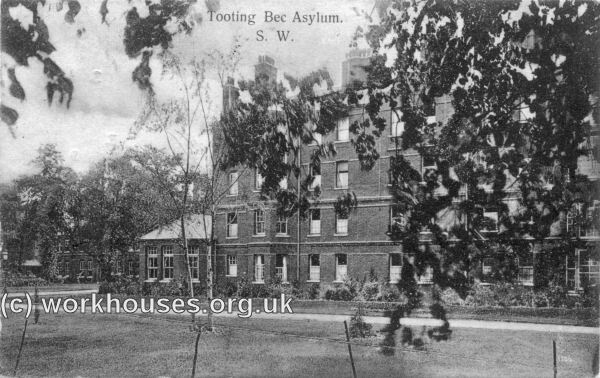 The new asylum was erected in 1899-1903 on a 22-acre site at Tooting Graveney, formerly part of the Tooting Lodge Estate, and which the MAB had acquired in May 1894 for £27,000. The buildings were designed by A and C Harston whose other work included the Poplar and Stepney Sick Asylum in 1868, and the Lewisham Union infirmary in 1891. The main construction work cost just over £200,000. The layout of Tooting Bec was deliberately intended to follow that of the existing institutions at Leavesden and Caterham. It comprised two rows of ward blocks placed either side of a central group of administrative and service buildings. The ward blocks were all three-storeys high with a twenty-four-bed ward on each floor. Originally nine ward blocks (five for females and four for males) were planned although the initial construction included only seven (for female and 3 male) with space left for the two remaining blocks which were added in 1906. The scheme also included a block at each side for 'probationers' and one for attendants. The central group of buildings included a four-storey front block containing staff offices and rooms, and a single storey section to the rear which included stores, a dispensary, quarters for domestic staff, a laundry, boiler-house, gas-house and dynamo-house. Large water towers were placed either side of the domestics block and attached the ends of two of the ward blocks. Two three-storey nurses homes were placed at the north of the site, each floor of which contained single rooms either side of a central corridor and a recreation room at one end. All the blocks were connected by covered walkways. The ward blocks were also connected at their far ends by fire-escape bridges on the first and second floors. These could also be used in fine weather as verandahs for patients unable to negotiate the stairs. A detailed description of the scheme was included in The Builder in June 1903, extracts of which are included below. THE NEW ASYLUM, TOOTING BEC. THE accompanying small block plan shows the general arrangement of the several buildings. The asylum forms the principal feature with its central group of administrative buildings, male wards to the left, and female wards to the right. The entrance is from Tooting Bec Common, but there is a second entrance from Church-lane, for bringing in coal and heavy stores and removing refuse, for which purpose a granite tram-road has been laid through the workshop yard to the several coal-stores, and a weighbridge fixed. The asylum has been designed to afford accommodation for 996 patients, but, for the present, two blocks have been omitted, reducing the number to 804. Staff accommodation has been provided for seventy men and 105 women. The infirmary blocks are three-story buildings, and on each floor there is a dormitory for twenty-four beds, and smaller dormitory for six beds, and two single rooms. The dormitories provide for each patient a lineal wall space of 6 ft., a floor area of 72 ft., and a cubic space of 936 ft. At the further end of, and separated from the main dormitory by a dwarf partition, is a large dayroom. Each floor is self -contained and separately approached from the staircase. It forms, in fact, a flat for thirty-two patients. At the entrance end are two single rooms, linen and day clothing rooms, broom recess, bathroom, and ward kitchen, with inspection window overlooking the large ward. The sanitary annexe is near the centre of the east side of the ward, and connected by covered bridges with cross ventilation. The staircases are formed of concrete with steps 5 ft. wide, in short, straight flights, encircling a brick centre shaft, which contains a hand-power lift for raising coals, &c. At the rear ends the blocks are coupled on the first and second floors by means of bridges formed of concrete and steel, which afford a ready means of escape in case of fire, and in suitable weather serve as ambulatories for the use of patients. On each floor of the staircase is an enclosed recess for the dirty linen basket, opening direct to the external air. The floors throughout are of concrete and steel construction, without voids of any kind, and the spaces below the ground floors have been solidly filled in. The ward floors are finished with polished oak, with terrazzo margins and curved skirtings. Other floors are finished with terrazzo. The walls are plastered with harrow selenitic cement and have curved internal angles. The large dormitories are warmed by Hendry & Pattison's central air-chambered stoves with descending flues, and the dayrooms and small dormitories by similar side stoves. In addition, there are hot-water radiating coils and radiators in the smaller rooms and offices. The windows have double-hung sashes and fan sashes with glazed hopper cheeks, and below each ward window is a grating with a valve for the admission of fresh air at a point at which it will impinge upon the hot-water coils. In the smaller rooms the air is admitted to the base of the radiators. The probation blocks are somewhat similar to the infirmary blocks, but provide on each floor day and night accommodation for twenty patients only. A receiving-room adjoins each of these blocks. only. of the single rooms in each block have been padded by Pocock Bros. The central group are administrative buildings, and the front portion contains the offices and quarters of the chief officers and the committee-room. The kitchen is 43 ft. by 32 ft. ; scullery, 43 ft. by 22 ft., with vegetable washing-room, cooks' store, larder, &c. Both kitchen and scullery are lit by windows on three sides and by lantern lights, the floors are paved with silex stone, and the walls lined with opalite. They are fitted with steam-jacketed boiling pans in central groups, beef tea and milk pans, steam ovens, gas ovens, hot plates and grillers, and a bakers' oven for pastry. The contract for these fittings was undertaken by Messrs. Moorwood, Sons, & Co., Ltd., and Messrs. H. Smith & Son built the oven. The arrangement of the laundry is a new departure initiated by the Managers. It has been customary hitherto to divide the asylum laundries into four separate departments, each practically a complete laundry for male and female patients, and male and female staff respectively. This, of course, involved expense in building, and rendered supervision difficult. Acting upon the Managers' instructions the architects have much simplified this building, and it now has but one washhouse and one ironing-room for the whole of the work. There are separate receiving-rooms and packing-rooms for staff and patients, a steeping-room for foul linen, and four drying-closets. The laundry has been fitted up with the most modern and approved machinery and fittings under the supervision of Mr. W.T. Hatch, Engineer to the Board. It is electric driven, and the drying-rooms are fitted with horses, the drying being effected by hot air on the Plenum system. The contractors for this work were Messrs Entwisle & Gass, of Bolton. The mortuary is near the back entrance, and consists of a dead-house, fitted with a cabinet ; a friends' room, post-mortem-room, and pathological-room. A disinfector-room is being built at the west end of the boiler-house block, and will be fitted with a Lyon's steam disinfector, with vacuum apparatus. At the rear of the laundry is the boiler-house, with steam coal store, gashouse, dynamo-house, and cellroom, and in continuation of the same block two large stores for house coal in immediate connexion with the side covered ways. All these buildings open into an enclosed workshop yard. The buildings generally are built of stock bricks, faced with Lawrence's red bricks with blue Staffordshire plinths, and they are covered with Bangor slates. The boundary-walls are built with pressed Leicester red bricks and blue Staffordshire plinths and capping. Next Tooting Bec Common the land is enclosed by a wrought-iron fence, 8 ft. 6 in. high, supported by cast standards. The corridors have concrete flat roofs covered with asphalt, the covered ways have glass roofs, on Rendle's system, carried upon iron columns, and the floors which cover the pipe ducts are of concrete asphalted. The water-supply is from the mains of the Lambeth Waterworks Co. For fire purposes, a 6-in. main is run to, and through, the main ducts, forming a ring with 6-in. and 4-in. branches. For the domestic supply, two cast-iron tanks, each upwards of 25,000 gallons capacity, have been erected over the staircases of the two central blocks at a height of go ft. These tanks are connected with the fire main, so that in case of a temporary stoppage of the company's supply the water in the tanks will be available, and the pipes are so arranged that one tank may serve the whole building while the other is being cleaned. The rain-water is collected in an underground reservoir of 120,000 gallons capacity situated in front of the main building, this being the lowest part of the site. The reservoir has a wash-out pipe and an overflow to the drainage system, and the water is pumped by an electric pump to the laundry-tank for use in the laundry and as feedwater for the boilers, the pump being controlled by a switch in the boiler-house. There are three steam boilers of the Galloway type, with Green's economiser and mechanical stoker by the Underfeed Stoker Co., the forced draught for which is furnished by a Sturtevant blower driven by an electric motor. These boilers form the heat centre for the whole building. supplying steam for warming purposes, for heating water, for laundry and kitchen, and steam-supply mains are carried through the several ducts, and the water of condensation is brought back to the hot well next boiler-house, and re-used as feed water. The hot-water pipes and radiators in the several blocks are worked by Royle's calorifers with automatic control attachments, which regulate the supply of steam to the quantity necessary to maintain a suitable temperature. The hot water for baths, lavatories, sinks, &c., is heated by means of a similar calorifier in the basement of each building, with circulating pipes to the several fittings. The lighting installation consists of about 2,300 glow lamps of 8 c.-p. or 16 c.-p., and twelve arcs for lighting the laundry, and has been carried out on a novel principle devised by the consulting engineers. This system, which may be called the draw-through concentric system, consists in running on the surface of the walls, buried in the plaster, small brass pipes varying from 5-16 in. to 7-16 in. internal diameter, and drawing into them a single (or in the case of a three-wire circuit, two) insulated conductors, the pipe serving at the same time as a channel for, and a protection to, the cable, and as the return conductor for the current, one pole being thus connected to, and at the same pressure as the earth, it is impossible to accidentally obtain a shock, and only half the usual amount of wire is required. The lamps are supplied at 120 volts on the three-wire system, and, there being a complete ring main, there are four circuits available for the current, rendering it practically impossible for any break-down of the main cable to put out more than half the lights at once. Each separate block has its own service box and main switch, by which it can be disconnected at any time from the ring mains, and all the fuses are grouped in distribution fuse-boards in the passages, there being not more than ten lights on a circuit. The electric generating plant marks a new departure in asylum practice, inasmuch as the motive power employed is power gas Instead of the more usual steam. The engine-room contains three gas-engines, each giving a maximum of 70 B.H.P. at about 210 revolutions per minute, and driving by belt a shunt-wound dynamo, giving 140 amperes 250 volts, at 550 revolutions. As a general rule two engines only are in use, one being a stand-by. In addition to the three dynamos there is a battery of accumulators, consisting of 132 L. B. 9-Tudor cells, capable of discharging at 56 amperes for ten hours at 240 volts, or in other words of supplying 1,000 16-c.-p. lamps for ten hours. Gas is supplied by the Mitcham and Wimbledon District Gas Light Company for cooking purposes, and for the plate warmers and hot plates in the ward kitchens. The soil and surface-water drainage discharge into the sewers of the Wandsworth Borough Council. An electric fire alarm system has been installed with thirty-six call boxes, ten alarm bells, and two indicator boards. There is also telephonic communication between the various departments through an "exchange" at the porter's office. Tooting Bec Asylum plan, 1903. The initial plans to transfer patients to Tooting Bec from Leavesden, Caterham and Darenth had to be postponed following a serious fire at the Colney Hatch County Asylum in February 1903. The still unoccupied Tooting Bec premises were used to provide temporary accommodation for Colney Hatch patients. In 1906, a recreation hall, also used as a chapel, was erected between the domestics' quarters and the laundry. A separate receiving home for children was also added at the eastern corner of the site comprising a central two-storey administration block and five single-storey ward blocks. In 1914, it was decided to double Tooting Bec's capacity from 1,100 to 2,200 beds. Bushey Down House, a large mansion adjoining the south-west of the site, was acquired and demolished to provide space for the expansion. 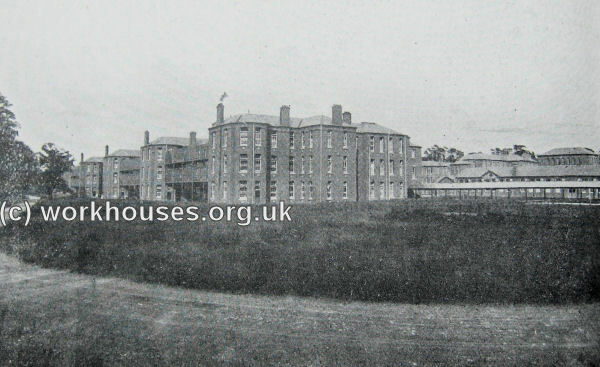 The new buildings, designed by Thomas W Aldwinckle, included four three-storey double ward pavilions for women, each containing two 30-bed wards on each floor plus single-bed wards for observation cases. There were three new male pavilions, again three storeys high, but with a single 36-bed ward on each floor. Each block had verandahs on the ground floor and escape bridges on the upper floors. In addition, new nurses' home was erected, the dining-hall and recreation room extended, and a third water tower added. The expansion work was interrupted by the First World War in 1916 and resumed in 1919, with the new buildings finally opening in 1925. The hospital, renamed Tooting Bec Mental Hospital in 1924, became used exclusively for accommodating patients with senile dementia. It transferred to the control of the London County Council in 1930 and underwent further expansion, changing its name to Tooting Bec Hospital in 1937. 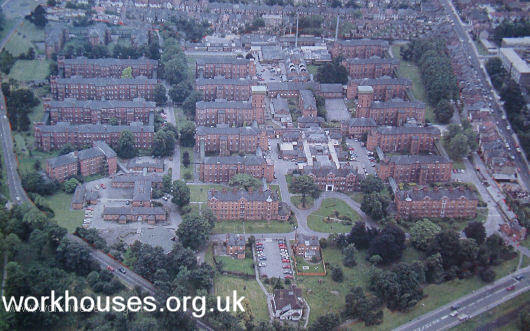 From the 1970s use of the hospital declined and in 1989 the site was put up for sale. The hospital finally closed in 1995. All the hospital buildings have now been demolished and the site has been redeveloped for residential use. London Metropolitan Archives, 40 Northampton Road, London EC1R OHB. Holdings include many post-1930 admissions, discharge and death records; Register of mechanical restraint (1903-48); Register of staff (1902-09); Register of temporary nursing and domestic staff (1930-65). NOTE that personal medical records have 100 year closure on access.